Michigan has an abundance of inland lakes and rivers for Kayakers of all ages to paddle on. Whether you have your own kayak or rent them from an outfitter there are some excellent places to go Kayaking at. here is a list in no particular order of parks that I think will make kayakers happy. I need to expand on this list some more so where is your favorite place to go camping if you’re a Kayaker? Please give me your suggestions in the comments below. You’ve heard the saying “location location location” and I think the best thing about Burt Lake State Park is its location in the Lower Peninsula. Located next to I-75 it’s easy to get to, especially if you have a large travel trailer or motorhome. 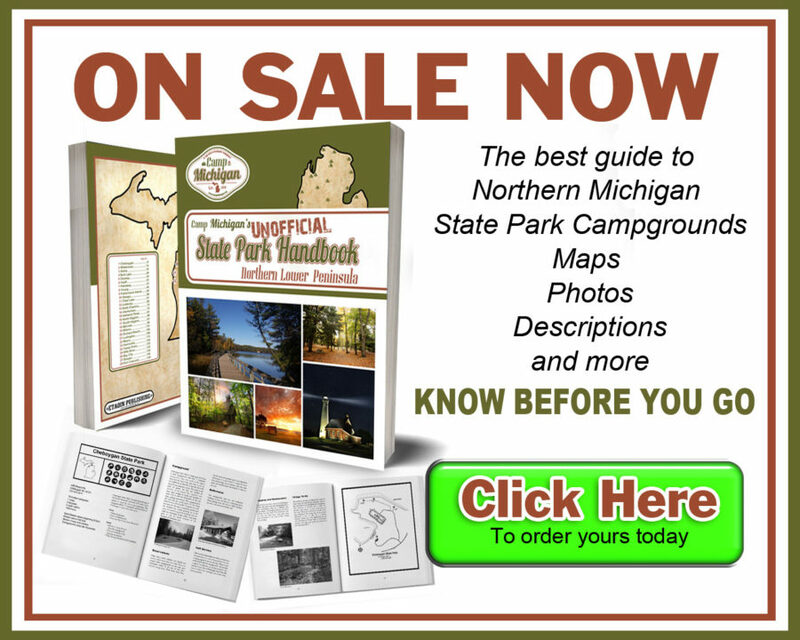 The park is centrally located in northern Michigan which makes it a short trip to many popular tourist destinations. It’s a wonderful park if you are looking for someplace to camp for a week or two. It’s easy to take a day trip to Petoskey, Mackinaw City, The Upper Peninsula Cheboygan or Mackinac Island. Or you could just hang out at the park and Indian River is close by if you need anything with a grocery store walking distance from the entrance to the park. The park is one of the larger parks in the state park system in terms of the number of campsites with 306 of them. A few years ago the park removed some sites reducing the number, but also enlarging the sites to accommodate larger RVs. The sites towards the lake have few trees so the will not have any shade. A few rows away from the lake the sites are wooded and most all of them will have full shade. Most site are level but well used and are mostly a dirt surface. I would stay away from sites around the 191 thru 196 area since there is a hill and I would not want to set up a trailer on them. the sites in the back of the park around by site 214 it can be noisy on Sunday morning since the Cross In The woods shrine is next to the park and you can hear the morning worship. All sites have electrical posts but some are 30 amps and some are 50 amps. the 50 amp sites are a few dollars a night more than the 30 amp service. If you need 50 amp get it, but if you don’t you can save a little money with the more common 30 amp sites. The bathrooms at Burt Lake vary from recently built to some that are rather old. The two bathroom buildings farthest from the lake are newer buildings but not brand new I would say they are about 25 years old and what I would say is the typical state park bathroom. It has a covered walkway with the bathrooms on one side and the other side of the walkway are 5 doors with showers. The bathrooms close to the lake are older bathrooms which I am guessing were built in the 50s. They are not as nice as the newer bathrooms. When I have camped at Burt Lake I would say they do an ok job of cleaning the bathrooms. I think it depends on how busy the park is. The beach at Burt Lake is one of the best beaches in the State Park system. It’s large with hundreds of feet of shoreline. The water is clean and clear with a shallow sand bottom so it’s great for little kids or setting your chair in the water and relaxing. The beach is kept raked and cleaned. There can be a lot of people from the large day use parking lot but the size of the beach can handle a large crowd. A separate area is fenced off for dogs so they can have a chance to cool off on a hot day.There is a boat launch but no lagoon like aloha. Most people anchor their boat offshore in the shallow waters south of the beach. The park is near the mouth of the Indian River which is part of the inland waterway the foes from Alanson to Cheboygan. Right outside the park exit is the town of Indian River. Ken’s grocery store is less than a quarter mile from the entrance and if you’re in a motorhome without a tow car you could walk or bike to it in a few minutes. If you don’t feel like cooking there are some good restaurants in the area and some fast food including McDonald’s, Burger King, and Subway. If you like to finish a hot summer day with some ice cream Indian River has you covered. There are a few different places to get some of your favorite flavors. My favorite is Drosts and their blueberry waffle cone. If you want to go to a big box store like Walmart or Meijers it’s about a 30min drive to Cheboygan or Petoskey. There is also a park store near the beach with Snacks, Ice cream, ice and a small selection of groceries. The prices are a little more than in town but convenient. If shopping is your thing there are a few nice gift shops in Indian River and you are not far away from some of the best shopping in Michigan with downtown Petoskey and Mackinaw City nearby. The park has a one-mile long foot trail in the park for hiking, but I would say Burt Lake SP is not the best choice if hiking is what you love to do. The sturgeon river flows through the northern edge of the park and is ideal for kayaking and canoeing. If you don’t have your own there are a few places In Indian River that you can rent them from and they will take you to upstream and drop you off. Indian River golf club is just north of town if you looking for somewhere to hit some balls around. To the south of the park on old 27 is the ORV trailhead if you looking for somewhere to ride your ATV or dirt bike. Burt Lake is an excellent park if you’re looking for a place to stay in the northern Lower Peninsula surround by plenty of places to explore and things to do. I would highly recommend it if you are looking for somewhere to stay for a week-long vacation. I would love to read your comments on what you like about Burt Lake S.P.